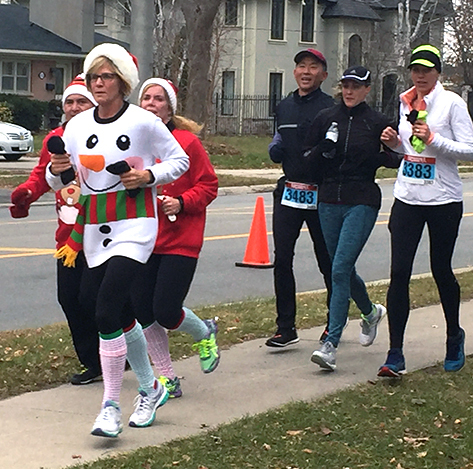 A group of about 200 runners rang in the Christmas season on Saturday morning by taking part in a charity event in Oakville. The runners gathered in front of St. Paul’s United Church on Rebecca Street for the Santa Shuffle Fun Run & Elf Walk. The event is a five-kilometre run to raise money for the Salvation Army in its drive to help the less fortunate during the holiday season. Heather Taylor, organizer of the event, says that all money raised goes to a good cause. “It goes to the community family services department of the Salvation Army,” she says. “So food banks, sending kids to camp, Christmas assistance.” Taylor says the event usually averages around 200 runners, but hopes to expand to 250. 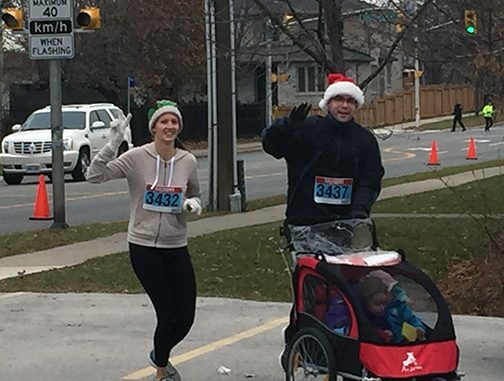 Kim Pickering (front) and Amanda Pizzario (behind Pickering) take part in the Santa Shuffle. Adults and kids alike came out to support the cause. The run isn’t timed, so everyone can just enjoy the experience and have a good time. Amanda Pizzario and Kim Pickering were part of a four-person group that came from Milton to participate. “It’s a fun way to kick off the holiday season,” Pizzario says. “It’s just friends coming together,” says Pickering. Entire families came to take part in the Santa Shuffle. Even babies were pushed along in strollers as their parents ran. Kids had the option of running a shorter, one-kilometre course. Santa Claus was waiting at the finish line to take pictures with the runners. Those not running were still showing their support by holding signs and cheering on everyone who came across the finish line. After the race food and drinks were available inside the church. Souvenirs including shirts and Christmas ornaments were on sale. People gathered both inside and around the finish line after the run to share their memories. There was even a little competition between the groups. 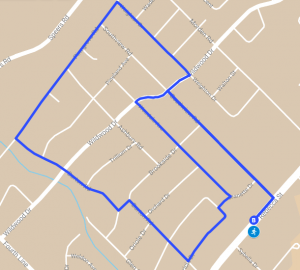 Route of the 5K run. Runners had a chance to register as part of a group of as many as 10 people. They could collect pledges and receive a free gift based on how much they raised. Anyone who collected more than $1,000 received a free shirt and a $100 gift card from Running Room. The Santa Shuffle started 27 years ago and is held across Canada. 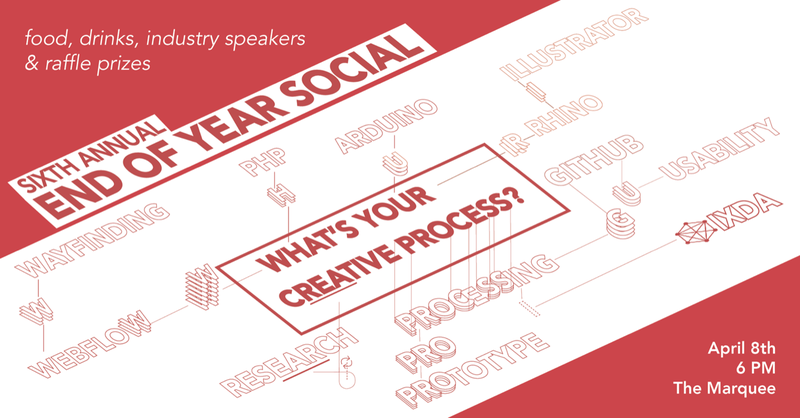 This year more than 40 cities held an event. Anyone who wants to donate can do so at the event’s website. 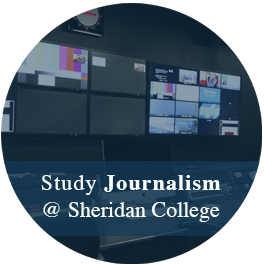 I am a second-year journalism student at Sheridan College with an interest in sports and community events. Follow along with my stories on Twitter @DavidSalituro.